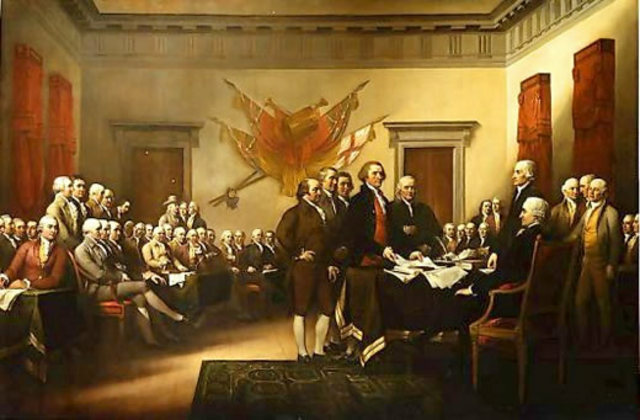 The American Revolution officially began when the Second Continental Congress adopted the Declaration of Independence on July 4, 1776, although fighting had begun in 1775. The French saw the possibility of success and formally joined the Americans by declaring war against Britain. By the time the war ended in 1783, France had borrowed 1500 million livres to finance its involvement in it. Interest payments on this money totalled 50% of the French government's total revenue. In July 1787 Comptroller-General Lomiene de Brienne, asked the Parlement du Paris to register the tax on property of all three estates. The Parlement refused and France entered a year of intense conflict between the royal government and the parlements. On July 5, 1788, with the government at a standstill, and in spite of his misgivings, Louis XVI gave in to the demands of the nobility and issued an edict calling the Estates General to meet in May 1789. In January of 1789, the Abbe Sieyes wrote a pamphlet titled "What is the Third Estate?" In it, the abbe denounced the nobility and said that the third estate was the most significant estate, in fact it was the nation. His words became the battle cry of the bourgeoisie. The Estates General was greeted by Louis XVI in the Hall of Mirrors at the Palace of Versailles on May 2, 1789. On May 5 the meeting convened with an opening speech from the king. There was disagreement amongst the three estates over voting methods in the Estates General. The third estate wished to have a "vote by head" method, whereas the First Estate and Second Estate wanted "vote by bloc" (1 vote per estate). The Third Estate was locked out of its meeting room as preparations were being made for a royal session of all three estates. 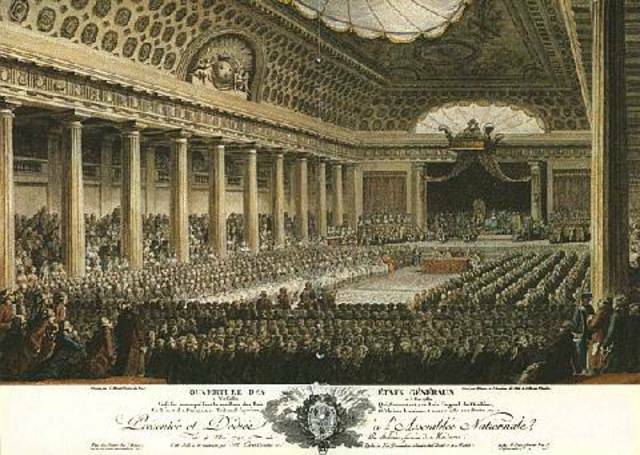 Confused and angry, the delegates met instead at an indoor tennis court on the palace grounds and signed an oath not to disband until they had drawn up a new, fair constitution for France. Paris erupted on July 14, 1789. The Paris mob was determined to arm itself due to presence of foreign troops in the streets of Paris. 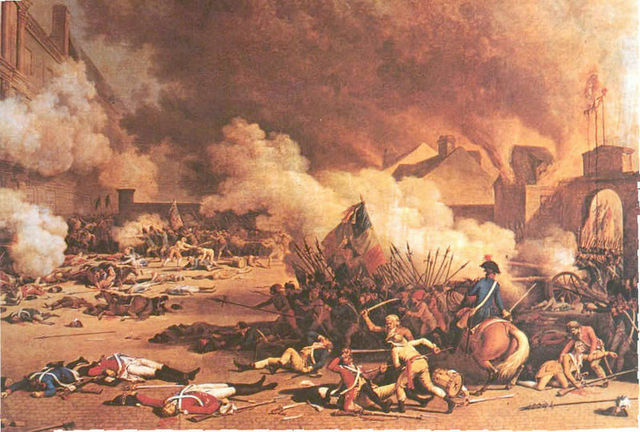 They first attacked the Invalides fortress from which they obtained 30,000 muskets. They moved on to the Bastille, an old fortress prison which had long been viewed as a sumbol of the king's absolute authority. 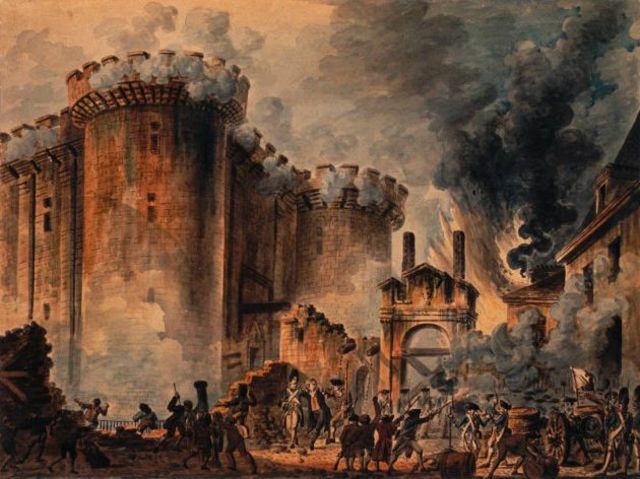 The mob attacked the Bastille and released the seven prisoners inside. Louis XVI recalled the popular Jacques Necker in response. The Great Fear spread across the country. Once the revolutionary spirit seized control of the people of Paris, people in surrounding areas began to demand cheaper bread and suspension of feudla dues. Civil unrest grew in the countryside, with many peasants attacking manor homes. Aristocratic property was destroyed by the peasantry. From July 20 to August 5, 1789, hysteria spread across the country, but was gradually put down by militias that imposed law and order. The panic of the Great Fear showed the peasants anger with the old, outmoded system of feudal obligations. Landed aristocracy in the National Assembly seized on the idea that the only way to stop the tide of violence in the countryside was to renounce feudal privileges. The aristocracy stripped themselves of their feudal rights and privileges. On August 11, 1789, the Assembly abolished serfdom. 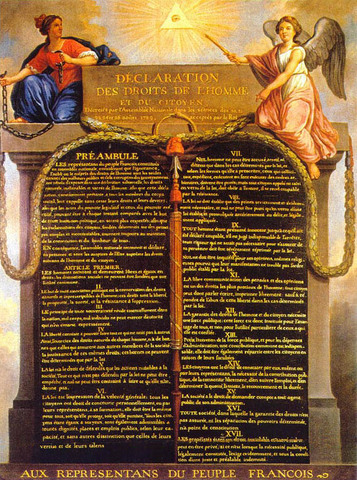 The Declaration of the Rights of Man echoed the sentiments of the Enlightenment philosophes, the English Bill of Rights, and the American Declaration of Independence. It asserted the political and social equality of all men, the sovereignty of the people, and the natural right to liberty, property, security, and resistance to opposition. The rumors of Louis XVI's offensive court party spreads throughout the streets of Paris, it was rumored that Louis XVI stepped on the flag of France. 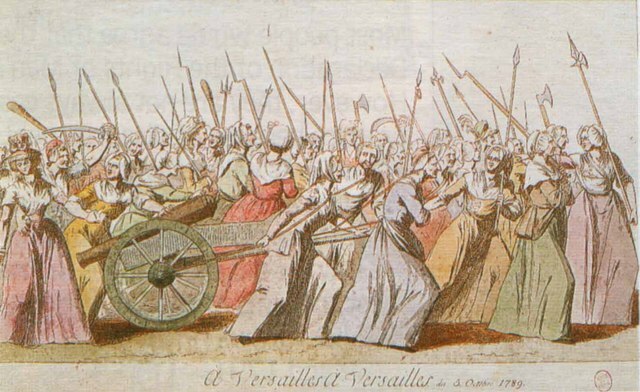 Women lead a march to Versailles to demand bread. The mob forces the royal family to return to Paris with them. Louis XVI signs the Declaration of the Rights of Man. The nationalization of Church lands was the first step in state control of the Church. On July 12, 1790 the National Assembly passed the Civil Constitution of the Clergy to bring the clergy under government control. Clergy would now be elected by all citizens and their salaries paid by the state. 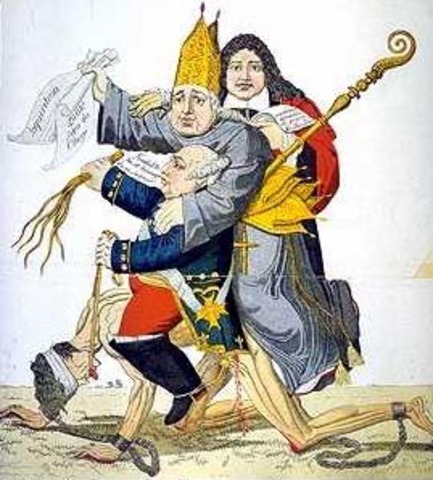 The clergy were required to swear an oath of allegiance to the Civil Constitution of the Clergy, essentially it required the clergy to acknowledge the supremacy of the French government over the Pope. Unrest in Paris in the spring of 1791 convinced the queen, Marie Antoinette, that the family must flee. With the help of a loyal friend, Count Axel von Fersen, an escape was organized. When they reached Varennes, they were recognized and National Guardsmen escorted them back to Paris through jeering crowds. On April 21, 1792, the French government declared war on Austria. As Prussia was allied with Austria, France found itself fighting a war against both countries. Paris seethed with discontent throughout the summer of 1792. Hungry, distrustful of government, and discouraged by failures in war. On August 10, 1792 they turned against their king. The mob stormed the Tuileries where the royal family was being held. They demand a new constitution and a convention to replace the Legislative Assembly. The Legislative Assembly dissolves and is replaced by the National Convention. In the fall of 1792, hysteria, uncertainty, and fear gripped the city. Rumors circulated that the 3000 prisoners held in Paris prisons were planning to stage an uprising. News that Verdun was threatened by the Prussian army was the spark that began what are called the "September Massacres". An angry mob led by Jean Paul Marat stormed the prisons and killed about 1600 prisoners. Social and cultural changes were implemented by the Jacobins during the time they were in control in an attempt to erase all traces of the Old Regime. They called their new society, based on reason, the Republic of Virtue. After six weeks of debate in the National Convention, with the Girondins wanting clemency for the king, whereas the Jacobins wanting to execute him. 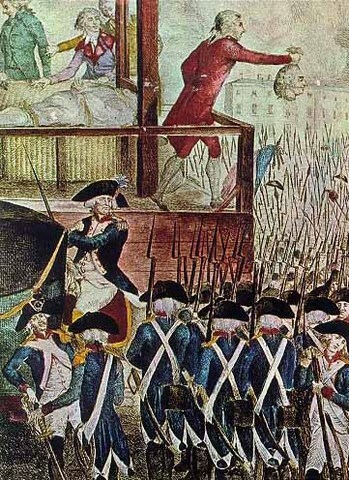 On January 21, 1793, the French government sent its former king to the guillotine. On August 23, 1793, the Committee of Public Safety made a decree that mobilized the entire French population for war. All unmarried men between the ages of 18 and 25 were conscripted. 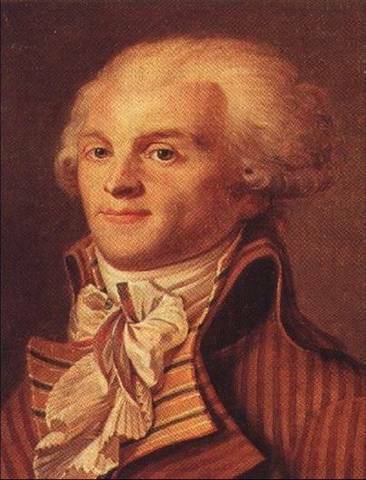 Robespierre was arrested on July 27 and executed the next day. In month of Thermidor in the new French calendar, Robespierre was deserted by his supporters, accused of being a tyrant. 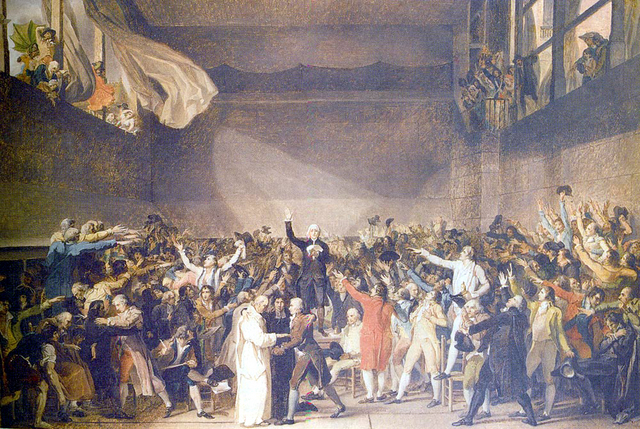 Robespierre wanted to extend emergency powers, but others felt that the emergencies were over and wanted to return to regular administration.